I get a lot of requests from Troops and Crews to take them caving. Mostly these requests are by email, one of more preferred ways for initial communications. Usually something is lost in a text only communication, that face to face conversation. Seeing a person’s face contributes a lot to a conversation. Seeing a person’s face tells a lot about what they need from me. Seeing a person’s face tells a lot about who they are. But none the less an email can communicate a ton of information along with attachments and links to other information they will need to proceed with their plans. The initial email was from Will asking for help caving with Troop 48. I did the usual reply of everything that he will need to get started. We conversed back and forth and set up a date to talk to his Troop about caving as well as a date to go caving. I went to the Troop meeting as we arranged with all my stuff and ready to talk about caving. I did my usual routine and looked for the first adult with a BSA Uniform. I introduced myself and asked for Will. He looked into a large room with several groups of boys doing things and he called for Will. Will came over and introduced himself. He’s “just a kid”. He’s the Senior Patrol Leader. THE youth leader for the Troop. He said he would be with me in one minute. Will headed off to each group and quietly said a few words to each and returned to show me which room we were going to be in to do “the talk”. Right behind us was a few other kids and an adult leader. Even with the adult in the room you could tell that Will ran the show. He made all the arrangements with me, the boys and the Troop Committee. This is the way a Boy Scout Troop is suppose to be run. Fast forward to the cave, we got inside OK and divided the six boys and two adults into two groups. Amos (adult) and Alex (kid) lead one group. Kathryn (kid) and I (adult) lead the other group. We went off into two different directions looking to not cross paths for a couple hours. Even though I had the “easy” group, I pushed and challenged them with all sorts of squeezes, crawls and climbs. They rocked everything we put them through. After a couple hours we did decide to take a break and went outside for a break. The adult with us was not excited about going back into the cave, but the boys really wanted to do more. Kathryn and I took them back in and showed them a few more places. Eventually we ran into the other group. They had the same idea. We all hung out and played in the cave till was getting close to the time we had to leave and headed on out. Unfortunately they had to get back and couldn’t stop with us for dinner. We collected all the gear loaned out and Will checked to make sure the paperwork was done and correct. Just before Will sat in the car to leave he turned and looked at me in his quiet and serious way said, “Next year!” I said, “Definitely.” He smiled for the first time that I saw and got into the car. It was great to organize this trip through the youth leadership instead of the adults. This is the way it should be. Kids have the ability to handle this kind of responsibility when given to them. I think I need to make a new rule that all planning is to be made through the youth leadership and not the adults. After all, we don’t take them caving. 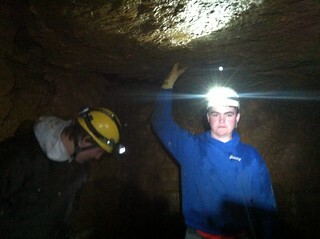 We teach them how to go caving. If you want to see more pictures, check out the photo album here. There are a few more videos posted. They are a little longer with less editing, but I get a kick out of watching them again so I’m going to share them with you too. You can see them here, here, and here. If you are interested in more information on setting up a caving program fro your youth organization (Boy Scouts, Girl Scouts, Y, AWAN, etc), send me an email at allenmaddox@youcave.org and I’ll do what I can to help you out. But let the kids plan it. They’ll enjoy it even more. You rock, Allen! That's definitely the way it should be done! Alejo, Thanks for the kind words. I see in your signature you are a Venturing Caving Coordinator. I'd like to know more about what you do. Please feel free to contact me at allenmaddox@youcave.org.